In a world where abortion is legal, pro-lifers are used to being considered “outcasts” who “only care about the unborn.” Because the way the media and politicians have portrayed the pro-life movement, we’ve always had to push to get the truth out. Any pro-life activist is fully aware how biased the mainstream media is when it comes to the abortion issue. It has always been that way, since the day abortion was legalized and the pro-life movement was born. In the early days of this battle, there was no social media or Internet and the mainstream media held the key to the door that separated the public from the pro-life message. The problem was, the mainstream media rarely reported on the abortion issue, and when they did it was with a biased slant that favored the pro-abortion side. (A pattern that continues to this day.) Because of this, it was difficult for the pro-life movement to get the truth out to people. Instead of solely focusing on exposing the abortion industry and saving babies, the pro-life movement also had to battle the mainstream media – a hurdle that at times felt impossible. Then came the age of the Internet, where people had access to an excess of information. With access to information, including information about abortion, individuals could seek out the truth for themselves. Pro-life organizations and activists were able to start providing information that people could get by the click of a mouse. People didn’t have to rely on the mainstream media to provide all of the information for them, individuals could seek it out on their own. As the Internet became more ingrained in everyday life, social media platforms took shape and changed everything. At first, social media platforms seemed like a Godsend to the pro-life movement. It provided a network where pro-lifers could connect with others and share vital information that the mainstream media was ignoring. Instead of worrying about people seeking the truth about the abortion issue, pro-lifer’s could reach out to the public to reveal the truth. It is clear though, that the social media that people once knew has drastically changed into something completely different today. Platforms like Facebook, Twitter, and YouTube are controlling content more closely. Instead of allowing users to create and choose how the content is spread, the platforms now use algorithms to choose the content for us. This new reality for social media is putting pro-lifers into the same position that we once were in. Social media corporations are adamantly pro-abortion and they push the pro-abortion agenda. 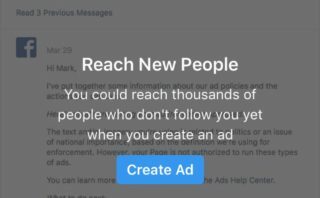 A great example of social media censorship occurred recently to Life Dynamics with Facebook. 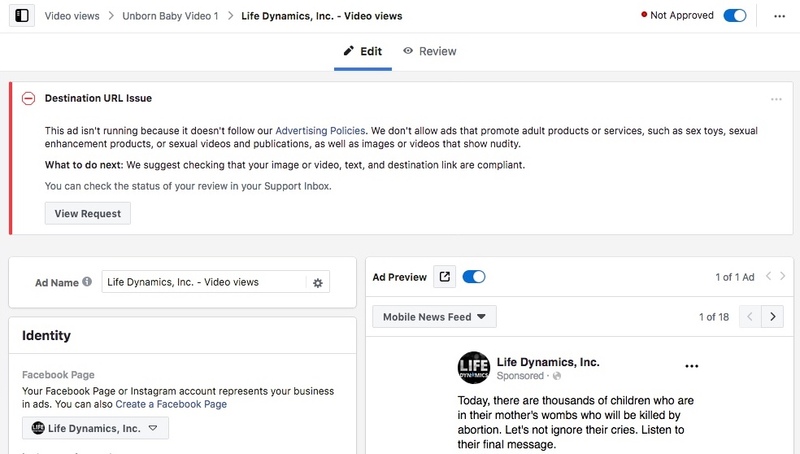 After a successful release and getting positive feedback about the “Message from the Unborn” video, we tried to purchase an ad on Facebook to help promote the video. The ad wasn’t approved for bogus reasons. (To learn more about the censorship and to watch “Message from the Unborn,” watch this episode of Life Talk). But we won’t back down. We will continue to push to get the ad approved. And despite Facebook’s denial for the ad, the video has gained a lot of attention. To learn more about the censorship of our new video “Message from the Unborn,” watch this episode of Life Talk). Censorship and media bias has always been a problem that the pro-life movement has had to face. Now, with social media corporations censoring the pro-life message, the pro-life movement has to deal with censorship from two sides. Even though people and corporations are trying to censor the pro-life message, we will keep going. We won’t let them silence us because doing so would mean silence for the unborn and their continued genocide. Times beforeI incorporated! It made s big difference insofar as incorporation as a 501 c4. They stopped locking me up here in Chicago! International Prolife Federation, also being a CAN-TV Producet helps!